SOLD Saturday Morning, March 1, 2008 at 10:00 a.m.
Offering a diverse selection of antiques and decorative accessories removed solely from private collections, estates and old households, featuring items from the lifetime collections of William and Claudine Ackroyd of Hampton Falls, NH and Betty and Clyde Roberts of Rollinsford, NH. 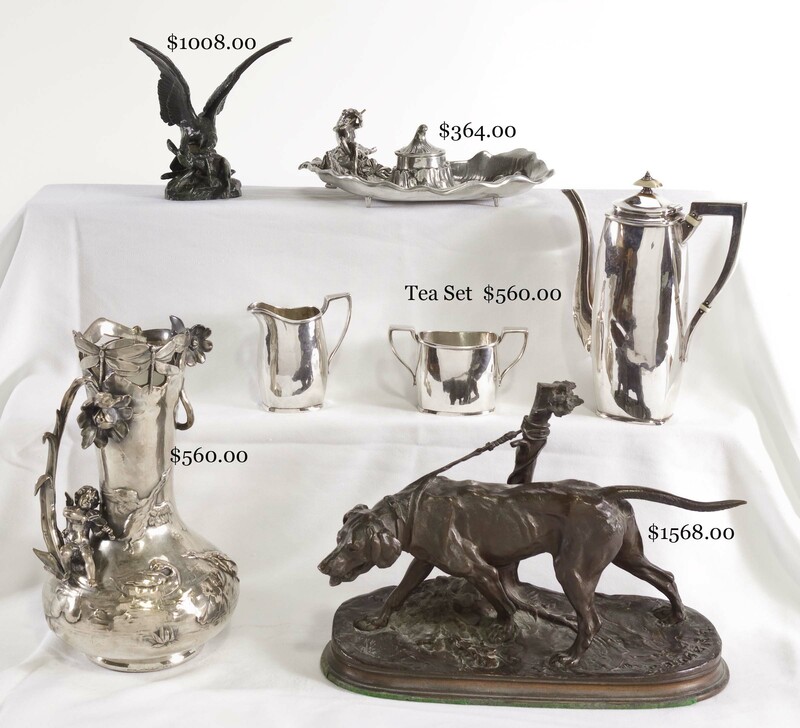 A complete listing of auction lots by category may be downloaded from our web-site. EARLIER FURNITURE: Portsmouth, NH Federal mahogany lady’s writing desk with distinctive inlaid oval paneled doors and a compartmented interior. Glazed door desk/bookcase with compartmented interior behind fall front false drawer. 18th c. 32 in. round mahogany tip table on snake feet. 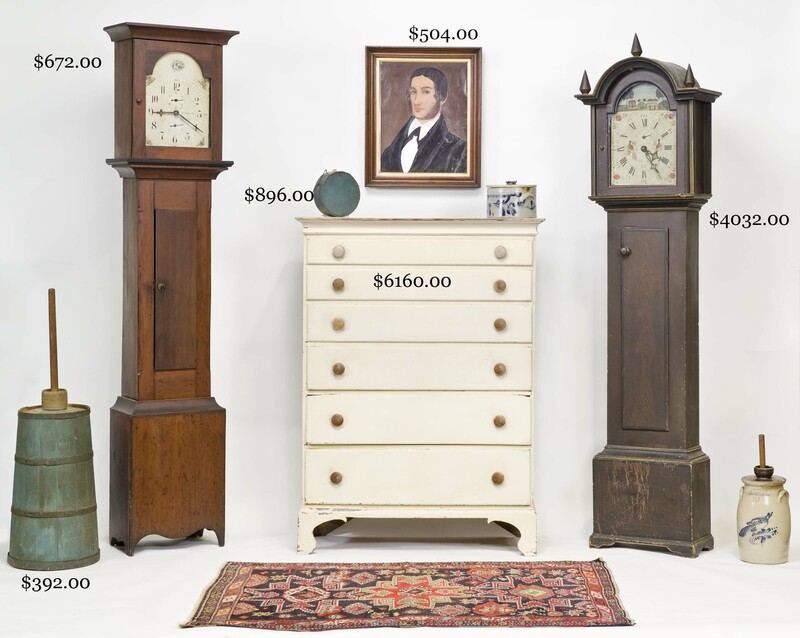 Tall case clocks with wooden works include an 18th c. grained example marked A. Goold, Hollis (NH), an unmarked NH birch example and one by S. Thomas, Plymouth. 55 in. bracket base Sandwich, NH six drawer tall chest with old red and blue underpaint. Seven drawer maple tall chest. 36 in. curly maple slant front desk. Saddleback crest banister back armchair. Mid-18th c. blanket box with incised initials and decoration. Sheraton mahogany grad. four drawer chest with unusual scalloped skirt. 46 in. mahogany deep drop leaf table on six reeded legs. 44 X 27 in. splay leg tap table on button feet and another diminutive example with stretcher base. One drawer 33 X 24 in. stretcher base tavern table with molded top. Distinctive Queen Anne style wing chair on stretcher base. 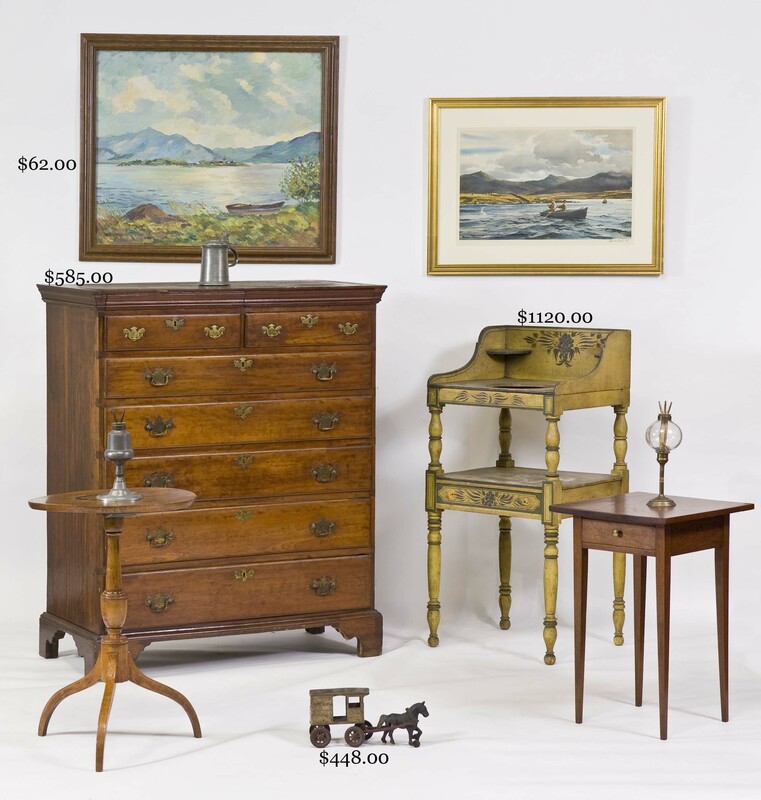 Numerous good tripod candlestands and one drawer stands of differing styles. 18th c. clerk’s desk on frame. Old grey 18th c. cradle. Early 19th c. old red one drawer blanket chest. Blanket boxes in old paint. Late 19th c. putty painted French style bed. 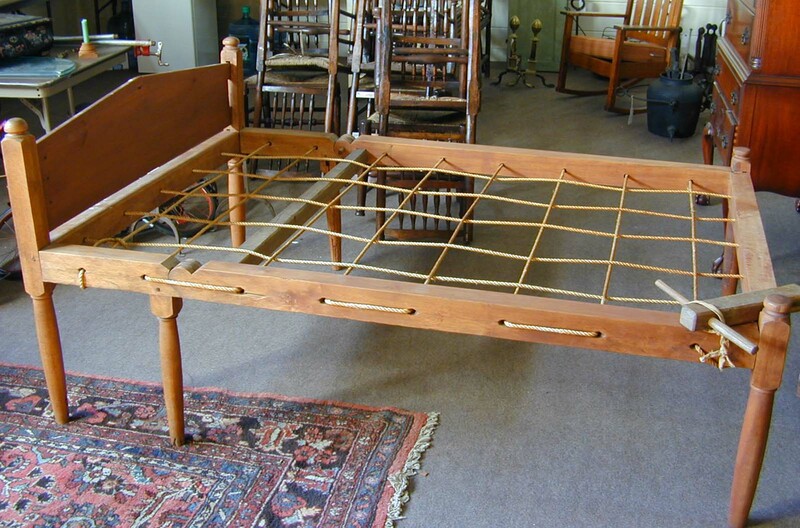 Rare 19th c. folding bed. 19th c. gilded, split column, oriental and decorative mirrors. Set six stylish rodback Windsor side chairs. Figured maple turned leg drop leaf table. Three N.E. decorated washstands (one, two, three). 51 X 28 in. 19th c. oak hutch table. 19th c. star-inlaid walnut storage chest. Two piece 18th c. English oak cabinet on stretcher frame with compartmented interior. 18th c. English 52 in. 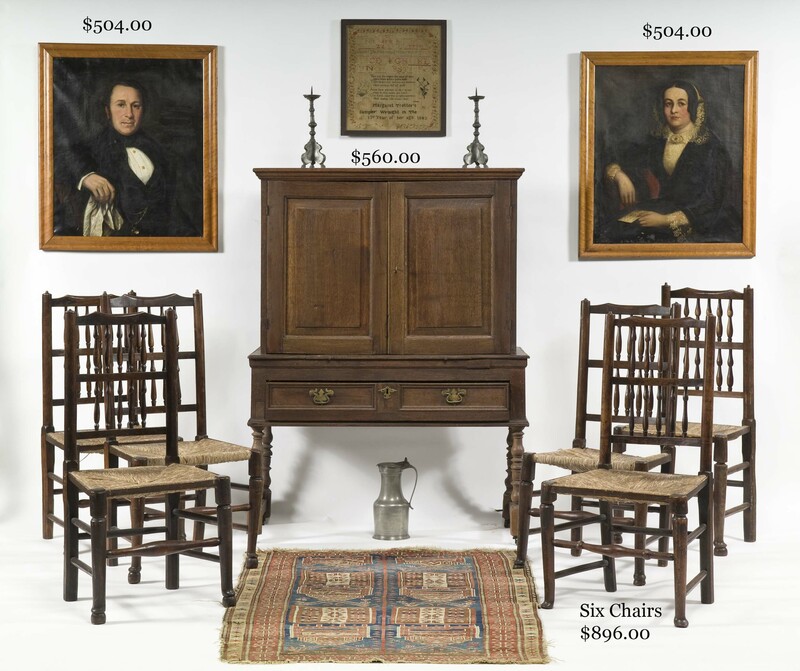 round oak drop leaf table and set of six oak spindle back dining chairs of the same period. Allan Breed, S. Berwick, ME, contemporary writing arm Windsor. 18th c. wall-papered NH fireboard. 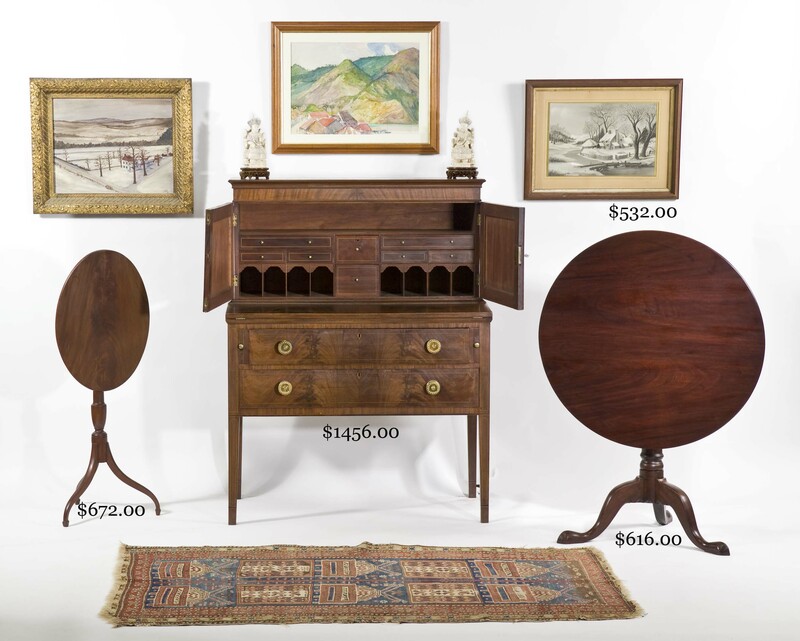 VICTORIAN AND EARLY 20TH C. FURNITURE: Labeled L. & J.G. Stickley No.742 mission day bed and No. 830 adjustable armchair. 40 in. burl walnut cylinder desk with glazed bookcase top. 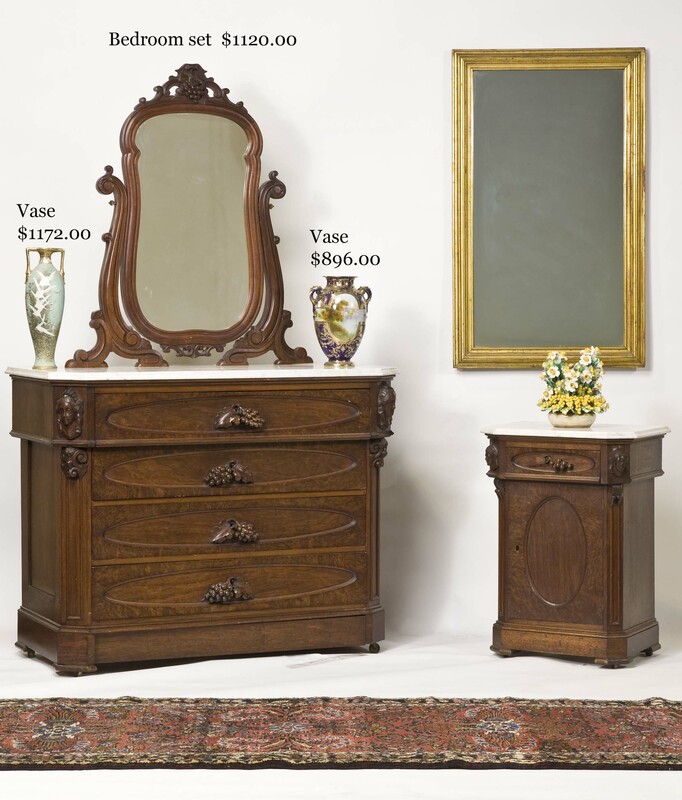 Three piece walnut bedroom group with ornamental carved heads. Acorn and grape-carved walnut bedroom furniture. Expandable 60 in. 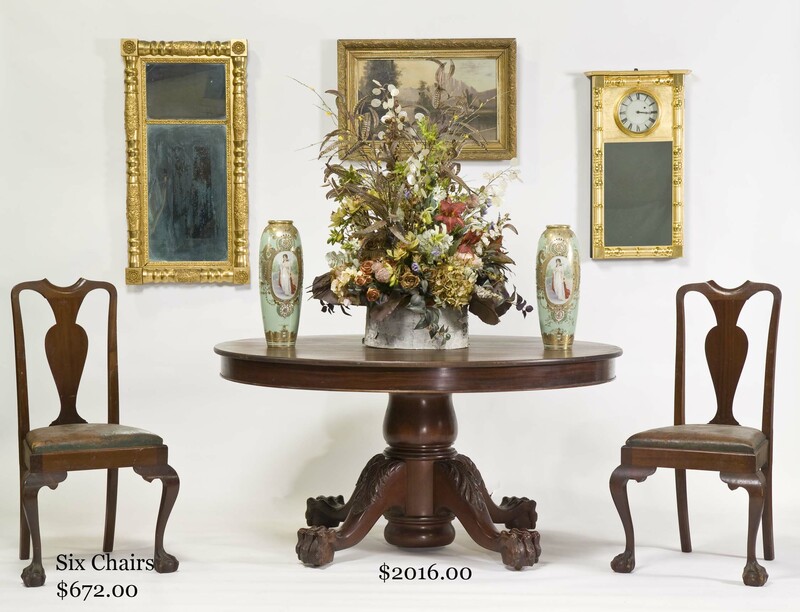 round mahogany dining table on deep-carved acanthus and talon and ball base. 60 in. round tapered leg mahogany dining table with leaves. 48 in. shaped marble top center table on acanthus carved base. Good turtle top side table. 87 in. oak stepback cupboard. Set six ball and claw foot Q.A. style dining chairs with leather seats. Set six Hepp. style tapered leg dining chairs. Diminutive bench made slant lid desk with shell carving. Good broken arch mahogany highboy on ball and claw feet. Walnut Victorian humidor. Unusual maple double bow-front china cabinet. Ball and claw foot sideboard and matching server. Leather wing chair. Good Victorian occasional furniture. Adirondack bench. ACCESSORIES: Tiffany picture frame and other good desk accessories. Interesting cast doorstops. Decorated toleware. Dutch, A. Marseilles and other German bisque dolls and doll clothes. Kelvin-White sextant. Buddy “L” Ext. Ldr. fire truck. Horse-drawn cast iron Bakery Wagon. Cast iron still banks. Banjo, Vienna regulator, French carriage and Vict. shelf clocks. Collection of 47 fine TAPE MEASURES - complete listing also available to download here. Good ESTATE SILVER: John Burt porringer, made for marriage of John and Abigail Howe in 1705. Sets and smaller lots of sterling flatware and serving utensils. Tea service and other serving pieces. Coin silver and interesting plated ware. Gold, sterling, diamond, other gemstone and Victorian costume ESTATE JEWELRY. Good watches and accessories. ESTATE CHINA, GLASSWARE AND POTTERY: Stately Nippon, incl. 15 1⁄2 in. slim vase with white cranes, pair of 18 in. vases with female portrait panels, 12 in. vase with scenic landscape and more. Flow blue Manila chamber set. Good Majolica. Rose Medallion. Satsuma. Imari. Figural Royal Doulton and Dresden. Mocha and spongeware. Salt glazed ware. Paperweights. Decorative 19th c. china and glass. Christmas plates. Decorated stoneware. Advertising crockery. 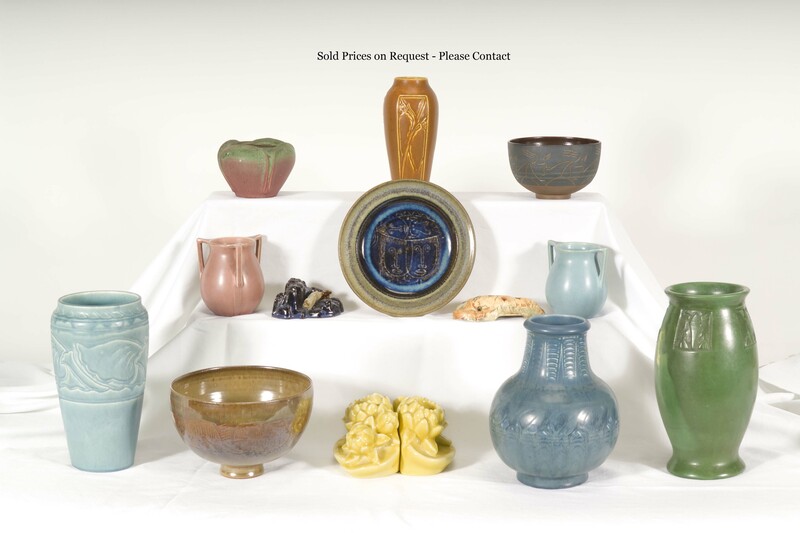 Good selection of AMERICAN ART POTTERY: Rookwood, S.E.G., Scheier, Fulper, Weller, Owens, Roseville. 8 1⁄2 in. Dedham rabbit bowl and plates. 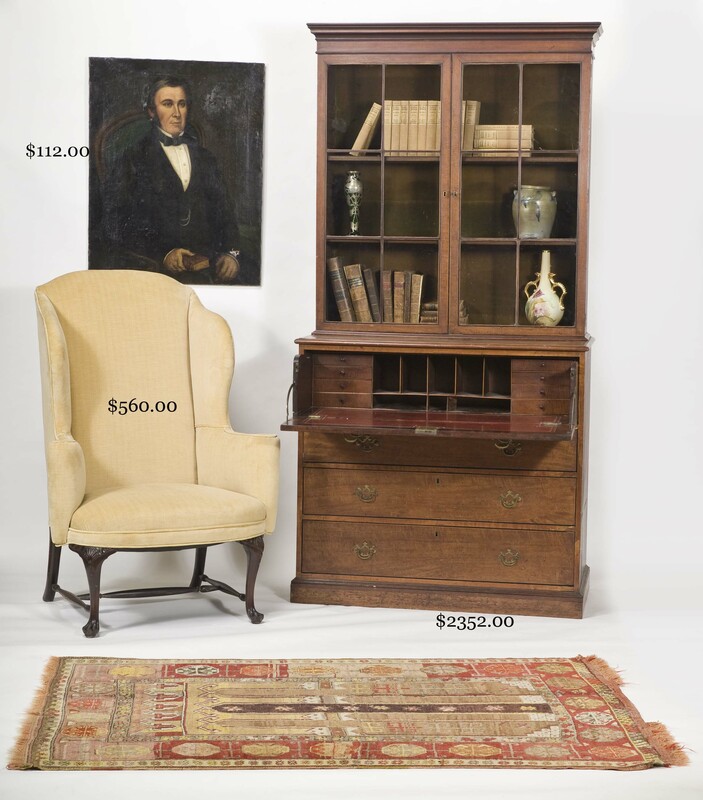 ESTATE ORIENTAL RUGS AND TEXTILES: Small selection, including scatter and room-sized rugs. 19 ft. X 32 ½ in. Persian runner. Paisleys. 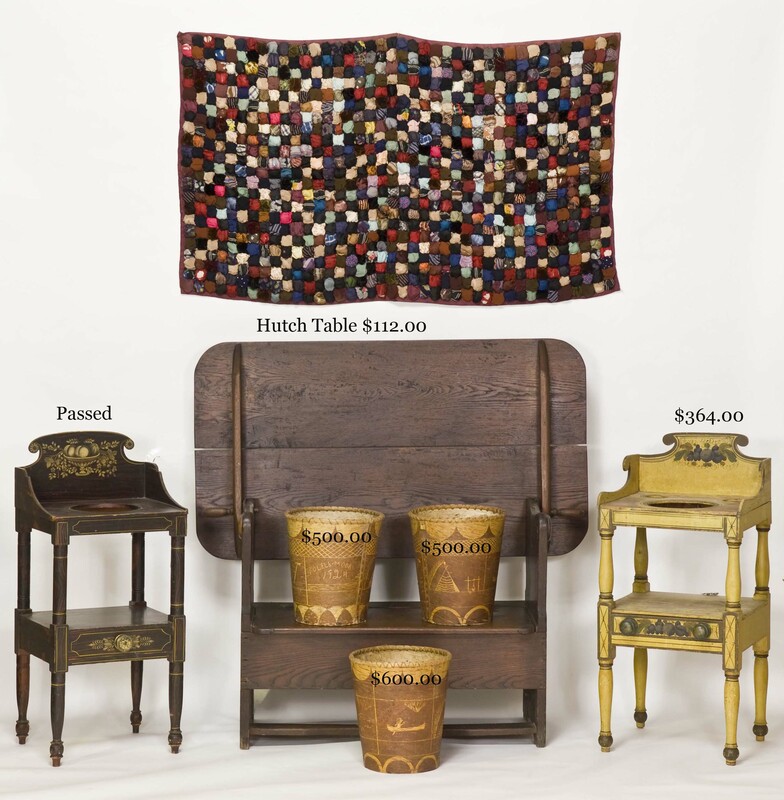 Graphic quilts, coverlets and hangings. Needlework samplers. OLD FIREARMS AND MILITARY: Winchester Model 1892. 51 in. long gun with Concord percussion lock. Old Stevens .22 long rifle. Ithaca Model 37 20ga. pump shotgun. Old loading tools. WWI framed commemorative embroidery. EARLY AMERICAN IRONWARE AND WOODENWARE. Early latches and hinges. 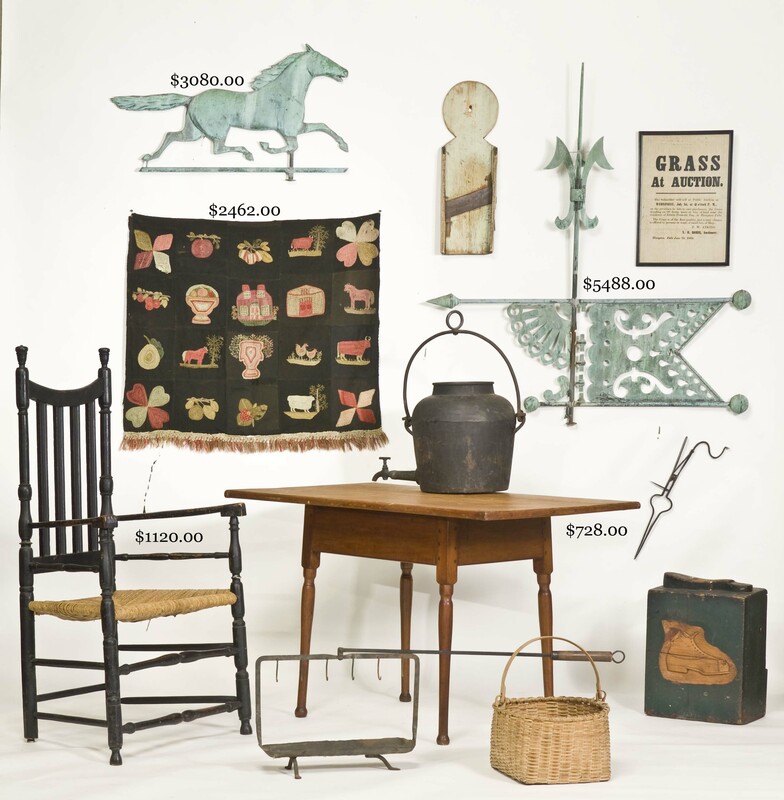 Wide assortment of iron and tin cookware and fireplace implements. Kettles, ovens, toasters, broilers, roasters, pans, griddles, tipping kettle, pipe tongs, sugar nips, wafer and waffle irons, etc. Wide selection of domestic woodenware, including rarer forms, some with carved decoration. Standing tape loom, good butter molds, utensils. Good baskets and boxes. Old blue painted butter churn. 18th c. blue canteen and containers and domestic woodenware in paint. Decorated bellows. Game boards. OLD TOOLS: Woodworking, cooper’s and leather-worker’s tools. Miniature planes and tools. OLD LIGHTING: Tin, pewter, iron and glass lighting Early pierced tin and paneled glass lanterns. Skater’s blue and green lanterns. Dietz bullseye. Dressel “NY State Canal Lamp”. Fancy iron 36 in. European entryway fixture. Victorian table lighting. FOLK ART: 1678 dated powder horn with incised animals, human figures and other ornamentation. 31 in. copper running horse and 42 in. banner weathervanes in verdigris surface from the Hampton Falls, NH Ackroyd home. 29 in. wooden silhouette horse vane. Three highly decorated Tomah Josef (Passamaquoddy Indian) birchbark waste baskets, measuring 13 in., bought by Katherine Hubbard during a 1920’s visit to Campobello. 24 in. hollow copper eagle ornament. 19th c. 34 X 30 in. folk textile hanging with house, animals and floral sections. OLD BOOKS, PAPER AND PHOTOGRAPHY: Three volume set of The Works of John Locke, Esq. , The Fourth Edition, 1740. The Sermons of John Owen, 1721. J. Gouffe’s Le Livre de Cuisine, 1867. First ed. of Theo. Roosevelt’s Le Citoyen d’une Rebublique, 1910. A.G. Spalding’s America’s National Game, 1911. Butterworth’s The Growth of Industrial Art, 1886. Town histories. Genealogies. Reference books on antiques and architecture. J. Haven’s 1784 Portsmouth, NH day book. Other early day books and ledgers from southern ME and NH, incl. 1817-24 Chadbourn family, So. Berwick, ME. 1850 Rollinsford (NH) Whig Caucus broadside. Old Hampton Falls, NH land documents. 1848 Portsmouth, NH whaling document. Newport, RI ship’s passage document. 17th c. parchment page from musical score. Framed 19th c. color entomological plates. Large postcard collection with NH and New England complements as well as mixed states. Framed landscape photography by John Paul Edwards. Temple (Haag Bros.) circus poster. Old portrait photography. OLD PAINTINGS, SCULPTURE AND PRINTS: 19 1/2 X 23 1/2 in. 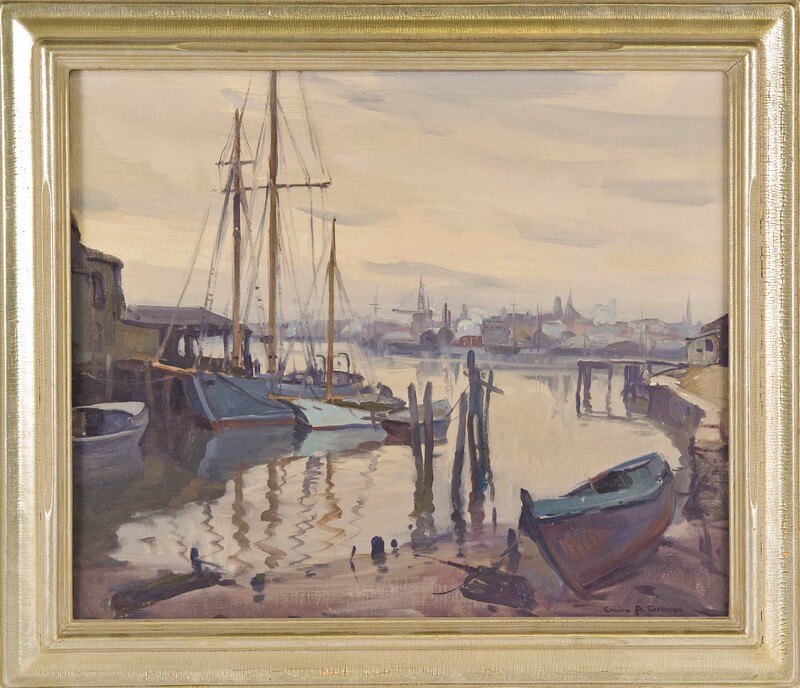 Emile Gruppe o/c, Fishing Boats at Dusk. 15 X 21 in. Charles H. Woodbury St. Lucia landscape w/c. 16 1/2 X 20 1/2 in. o/b depicting students, including one thought to be C.H.W.’s star student, Gertrude Fiske, inscribed in Charles Woodbury’s hand en verso, Painting in C.H. Woodbury’s Studio. Other small oils of Ogunquit views by Ross and J. Alexander. Unsigned 16 X 10 1/4 in. John Lafarge w/c of cardinal with family ownership history. 9 X 14 in. Geo. Carpenter coastal fall landscape. 18 X 25 in. 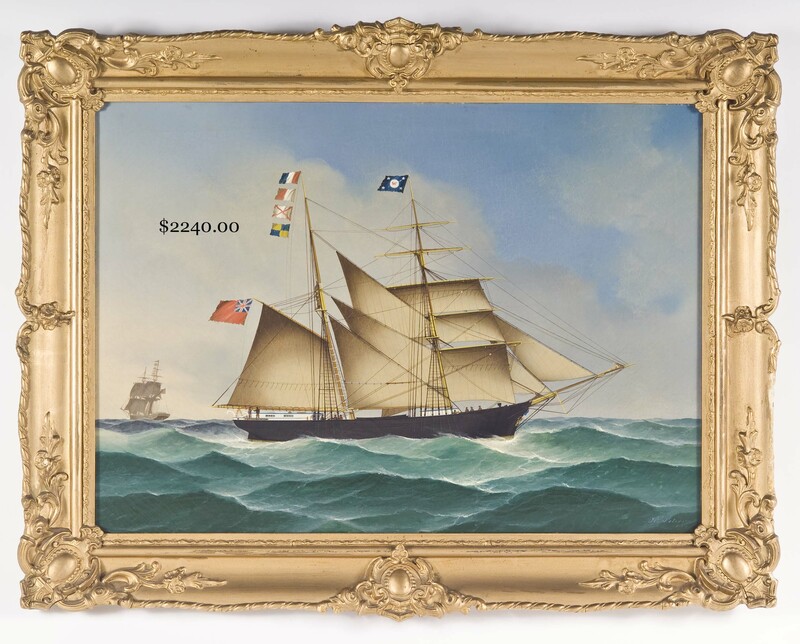 J. P. Petersen oil of British ship at sea, the G. Wheelwright. 14 X 21 1/2 in. 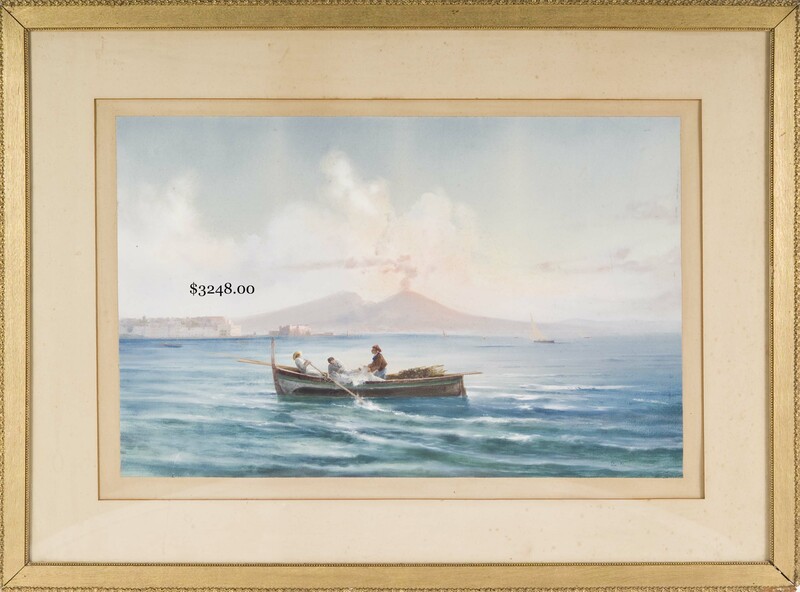 LaPira signed w/c and gouache of fishermen in boat near Mt. Vesuvius. Alfred Barraud (1849-1925) oil self-portrait. C. W. Anderson equestrian drawings and oil of mare and her foal. 106 X 51 in. 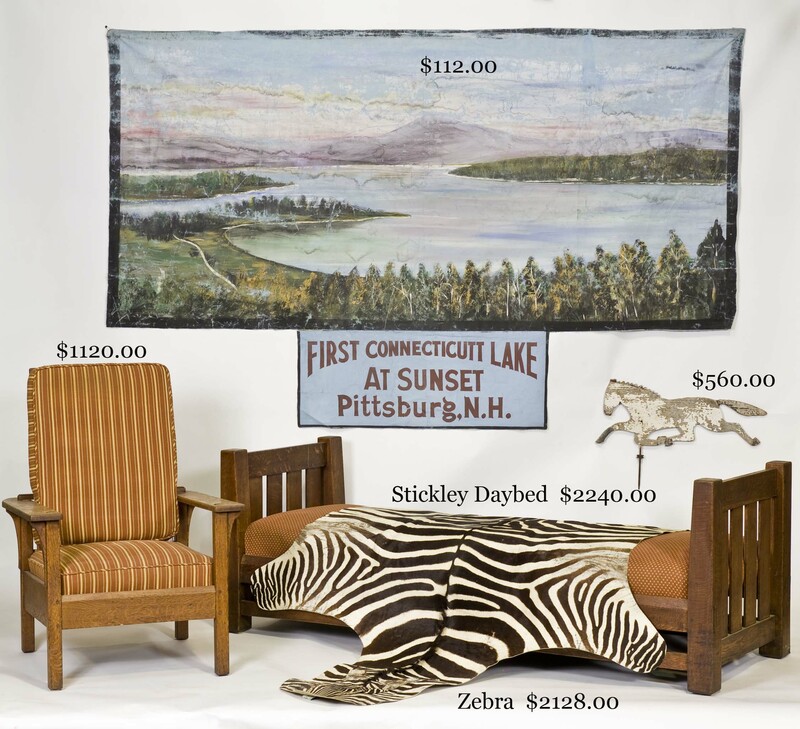 painted theatre curtain, possibly the work of Charles Henry, depicting First Connecticut Lake at Sunset, Pittsburg, NH. 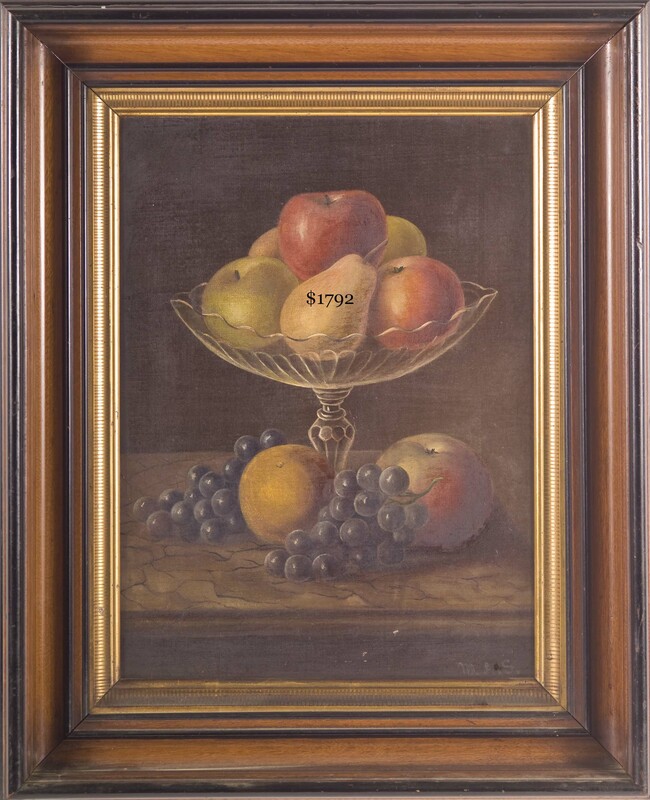 Martha A. Safford (studied under Benjamin Champney) fruit still life oil and charcoal winter landscape. 19th c. 20 1/2 X 14 1/4 in. o/c of The Flume (NH waterfall) with fisherman and others. Two good small 19th c. Bavarian valley landscapes. 27 X 31 in. 20th c. E. Mackel Bavarian landscape with Lake Chiemsee. 19 1/2 X 15 1/2 in. 19th c. oil portrait of a young gentleman. 36 X 28 in. 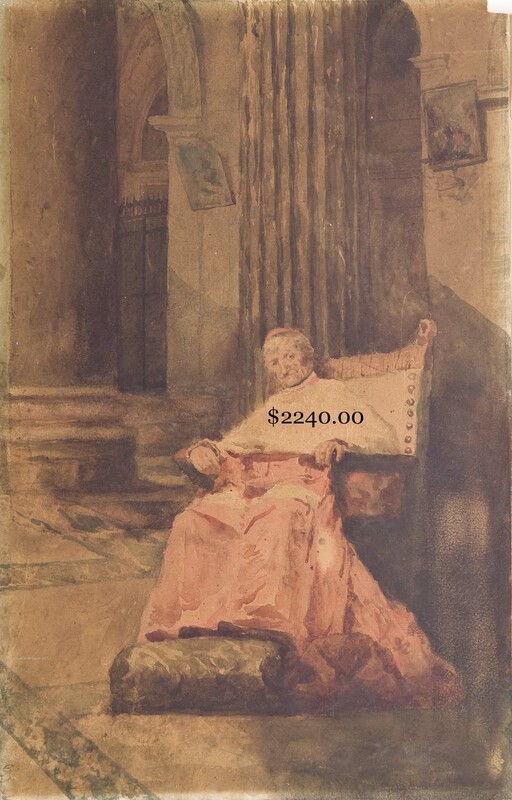 19th c. unframed oil portrait of a seated gentleman holding a book. 29 1/2 X 24 1/2 in. framed 19th c. oil portraits of man and wife. 13 X 15 in. egg tempura of an erupting Vesuvius beyond the watery foreground. 10 X 14 in. well executed pencil drawn Italy, Naples and Vesuvius. Anna and Arthur L. Morse MA North Shore oil landscapes. Charles O. Morse drawings. 19th c. Thurlo (?) drawing of Chain Bridge at Newburyport. 49 X 32 in. decorative tapestry, The Storm. Framed Persian w/c’s of exotic subjects. 9 1/2 in. P.J. Mene bronze of dog tied to post. 6 in. Barye bronze of eagle feasting on rabbit. 18 in. J.E. 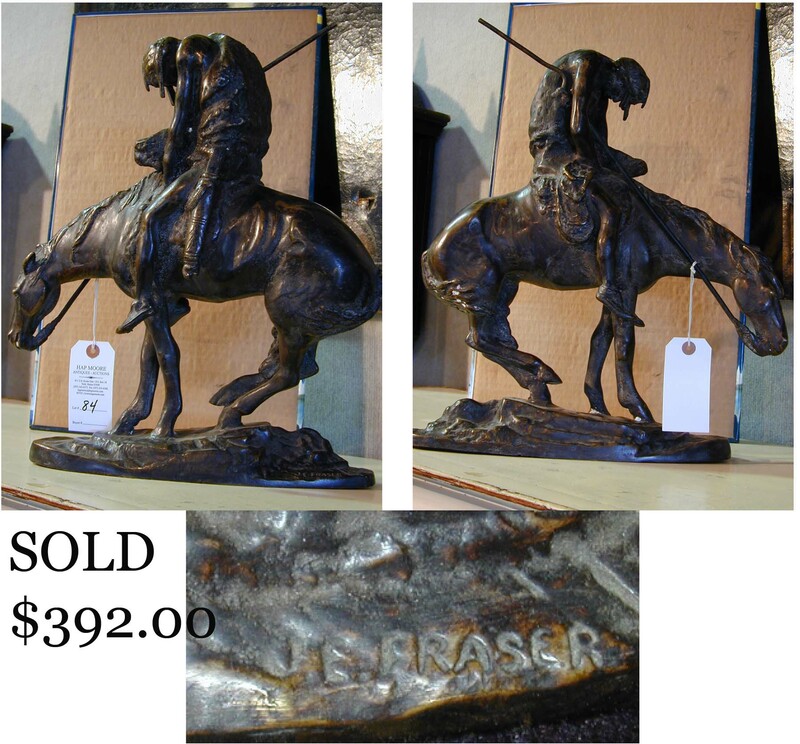 Fraser equestrian bronze, End of the Trail (?). 9 1/4 in. J.&M. signed female figural bronze plaque. Oriental carved ivory and other decorative sculpture. 15 1/2 X 23 3/4 in. Ogden Pleissner print of fishermen in boat near shore. Anthony A. Tillman decoy prints. Currier & Ives New England Home and American Homestead, Summer. Nutting, Thompson and Sawyer prints. More decorative art work.